Oily skin is one of the most common skin types and one which I am asked about all of the time! If you suffer from oily skin then you will notice that your skin can have an uneven surface layer due to open pores, excess sebum, bumps underneath the skin and whiteheads. Your skin is also prone to breakouts and blackheads but it is important to determine whether your breakouts are a result of oily skin rather than acne as acne skins will need to be treated a little differently and usually include a referral from a GP. You may notice that your skin produces more oil at certain times, such as during your menstrual cycle or when you’re physically or emotionally stressed. Your environment and lifestyle can have a huge impact on your skin but with the right use of products and treatment you can help to balance your oily skin. Keeping your skin clean is key alongside a stable daily routine to balance the skin’s pH and ensure the skin is getting enough nourishment as well as helping to reduce excess oil. Using the wrong products can actually encourage your skin to produce excess oil. 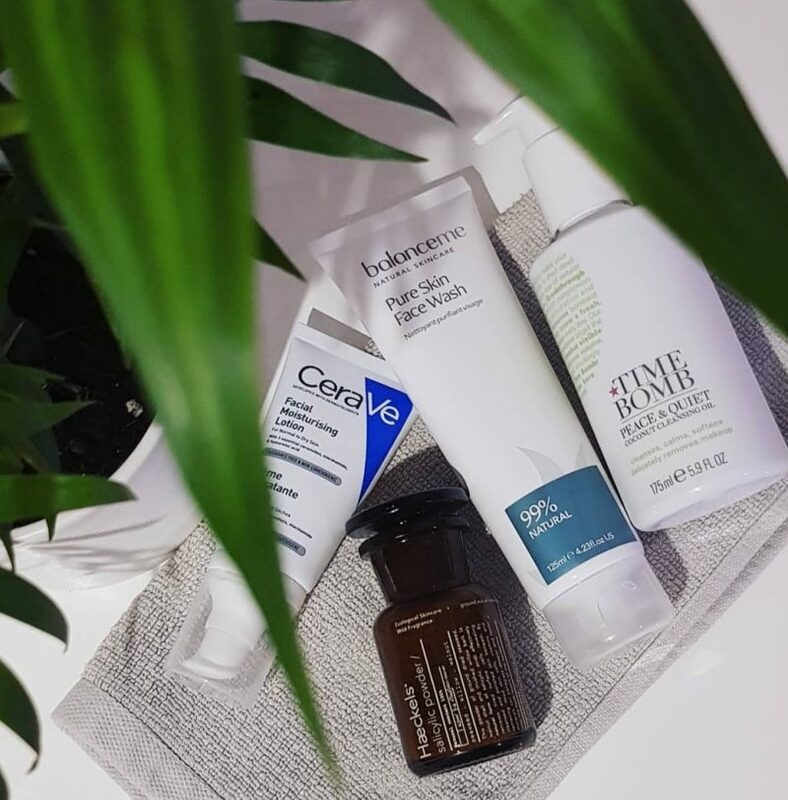 It is recommended to use the correct products targeted for oily skin types to ensure the best results and make sure that your skins needs are cared for in the kindest way. Balance Me Pure Skin Face Wash – Great for balancing the skin without disturbing it’s natural protective barriers. Simply massage into damp skin and rinse off with warm water. Superfacilist Salicylic Face Wash – Using morning and night to to help detoxify and deep clean congested skin of daily impurities and excess oils without causing irritation. DHC Cleansing Oil – Melt away make-up and dissolve impurities, leaving your skin clean, soft and radiant. Simply massage onto dry skin and rinsing off with warm water. Time Bomb Peace & Quiet Cleansing Oil – This gentle oil cleanser transforms into a milky emulsion when used and rinses off easily with warm water to leave your skin feeling clean and calm. Haeckles Seaweed & Salicylic Powder Exfoliant – Mix half a teaspoon in with pump of your favourite cleanser and massage into skin twice to four times a week to remove dead skin cells. The Ordinary Salicylic Acid 2% – Use as a night time serum treatment, apply onto clean skin every other night and leave on. Pixie Peel Pads 20% – These pads will helps to minimize pores, breakouts, and fine lines while helping to even even skintone. Use once a week remove with water after 8 minutes. Apple cider vinegar – This is probably a product most of you have in your store cupboard and is great natural toner. Use daily after your cleanser as part of your skincare routine. Time Bomb Glory Days – Applied daily to clean skin this moisturiser primes, brightens, and evens skin tone without leaving a greasy residue. CeraVe Facial Moisturising Lotion – Lightweight & non-greasy, this moisturiser helps to restore your skins protective barrier. Embroyolisse Lait Creme Concentre – A richer consistency for dehydrated and oily skin. Massage gently into clean dry skin morning and night and leave to penetrate the skin. Indie Lee Squalane Facial Oil – Apply 2 or 3 drops of oil to freshly cleansed skin, both day and night to help restore stressed or imbalanced skin. Kiehls Midnight Recovery Concentrate – Warm the oil against your fingertips and Gently massage 2-3 drops evenly over your face before bed. Pai Rosehip Oil – Use before bed and apply 2-3 drops to the palm of your hand and use fingertips to gently massage into clean, slightly damp skin. Double up on your nighttime cleanse to keep skin super clean and ensure the days grime and pollution has been removed. Don’t be afraid of using oil products on your skin – gone are the days of oil producing more oil, we are better educated to understand that oil molecules are essential to balance the skin pH.